​"This is the loveliest facility at which I have ever had the pleasure of boarding. It is beautifully maintained all year round, no falling down fences or unmowed grass and the drives and parking area are always plowed in the winter. I trailer a lot and it is nice to know that I don't have to worry about being able to get my trailer out during the winter when I need to be at a show or clinic. Dottie maintains detailed records on each horse and feeding is tailored to each individual, hay is available at any time. The staff and family are friendly and welcoming." "I’ve been an equestrian and horse owner for over 40 years and have boarded at many, many facilities - including numerous hunter/jumper show barns. Evergreen is HANDS DOWN the best care I have ever received. It’s a strange and wondrous feeling to have absolutely no complaints - from the perfectly cleaned and bedded stalls, to nutrition, to unlimited hay, to the superior facility and grounds, and the invaluable, knowledgeable and professional staff and owners - I can honestly say that I am worry free and have never been happier. And more importantly, my HORSES have never been happier." "LEAD is a program through Lake County Educational Service Center that is designed for students in grades 9-12 who thrive best in a non-traditional classroom. LEAD is a separate public school facility, and caters to students who struggle with emotional disabilities or behaviors. The students spend the first half of their day learning vocational skills at various job sites around the community, then come back to school for their academics in the afternoon. The program also offers opportunities such as therapeutic art and visits from Crossroads counselors. The current group of LEAD students are all animal lovers, enjoying the non-judgmental bond animals form with us and just their ability to make us laugh no matter how rough of a day it’s been. When Dottie and Dorothy Bentley offered LEAD the use of Evergreen as a job site, they couldn’t have known what an impact Evergreen has had on the students. From the kindness of the people, to the beauty of the grounds, to the love of the animals, Evergreen is LEAD’s unanimous “favorite place to go.” It teaches the students about hard work, the care of horses, and what it takes to be a successful business owner. Dottie and her crew also teach compassion, patience, and generosity. And really, who else has a horse that can “smile” on command? LEAD is and always will be so grateful to the Bentley's and Evergreen for giving our students such awesome opportunities!" Check out some of the other awesome opportunities these students have by visiting their website for their vocational store front located in Painesville! Or even better, if you are in the Painesville area, stop by their storefront! You will not be disappointed! If you are ever looking for a special gift, enjoy shopping locally and helping these student be part of our community check out Unique Like Me! http://www.uniquelikeme.org! "Evergreen Farms is a premium boarding facility offering top notch care for your horse and excellent management. As a veterinarian, the level of cleanliness, organization and safety provided at Evergreen Farms really impresses me. Owners can rest assured their horse is in good hands under their care!" "Wow! So much to say about Evergreen Farms and the Bentley's that own it. First, the facility itself is extraordinary, with everything thing you need or want in a riding facilty . It is top notch! Second, the Bentley family is always there! Constantly working to keep Evergreen as beautiful as it can be, and it shows. Dottie is exceptional in caring for the horses, keeping records and most important, makes it her mission to know each horse and their personalities, so she knows when any of them are out of sorts. Last, I can say anyone who brings their horse to Evergreen Farms will not get better service, and care. I never have to worry whether my horse gets fed enough, did his stall get cleaned and what if I can't get there for a few days? We NEVER have to worry. The peace of mind we all have boarding here is beyond words. I am ever so grateful to the Bentley's and the care they provide my horse. Truly, Lake County's Taj Mahal for horses and horse owners! Thank you Dennis, Dottie, Dorothy and Staff." "I will forever express my gratitude and love for Evergreen Farms. The family and staff that run and own this incredible barn are among the most knowledgeable, professional and caring people I have ever encountered. This barn is always clean, neat and safe. They have the most beautiful grounds and trails for all to enjoy. The horses are so happy and extremely well taken care of all needs are always met. Evergreen allows me to balance work, family & horse and no one gets left out. Vacation is a true vacation for me now with no need to worry about my horse. At age 25 my horse is the happiest and healthiest she has ever been. I would like to state a fact that Evergreen Farms saved my horses life and I will forever be grateful for finding this horse paradise for my mare and myself!" "The Bentley family at EF has made my boarding experience with Lucky absolutely the most care free and professional I've ever experienced. Nature is an important part of horse ownership for Larry and I. The roads and trails are beautiful with mature trees as well as new plantings, and we look forward to our visits. Looking forward to many more years of an enjoyable equine relationship." 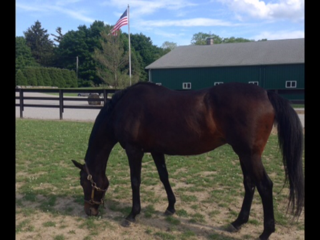 "We were one of the first boarders at Evergreen Farms so our 2 horses have been there for many years. It is an extraordinary barn & property and the Bentley family is so wonderful - Dottie watches over all of the horses like they are her own and is very knowledgeable and helpful. When we are out of town we never have to worry about the horses which is so nice. We agree with what all of the other testimonials have said and we doubt there is any barn as nice as Evergreen in the northern Ohio area. We feel very fortunate to have our horses there and would highly recommend it to others - the facility & care are the best." "My name is Tom Higgins. I have been shoeing horses professionally since 1980. Evergreen Farms is one of the finest barns I have ever worked in. The facility and care are top notch. Dotti is hands on with all the running of the business. She keeps meticulous records of all the shoeing an veterinarian appointments and work done.She is always there and helpful with any information I may need on any of the horses I may work on. Ramone is excellent barn help, good with the horses and very helpful to me when I need him. This is a excellent facility and I would HIGHLY commend Evergreen Farms to anyone." "The care at Evergreen Farms is the best! Lovely facility with gorgeous trails to ride along, and wonderful scenery! The barn staff is excellent and very friendly! Highly recommend Evergreen Farms! 5 stars!" 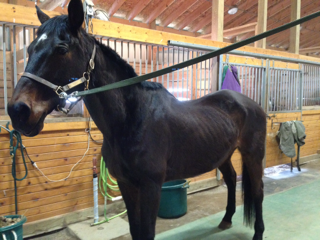 "There is no equine facility in the Northeast Ohio area that will offer better care for your horse then Evergreen Farms. From a trainers stand point the facility is above and beyond. You can ride in the spacious well maintained outdoor pen, take advantage or the large round pen, ride in the fabulous indoor arena or enjoy a relaxing trail ride thru the manicured park like setting. The staff at Evergreen treats everyone with a professional attitude and offers the most attention to detail care that any horse and owner could wish for." "Evergreen Farms has been an answer to my prayers. My senior horse is well taken care even when I can't get there to give her needed shots or lunge her. Veterinary issues are found promptly and immediately called to the owners attention. The footing is well maintained, the trails are beautiful, and the barn is meticulous. Fellow boarders are friendly and respectful. Would highly recommend!"